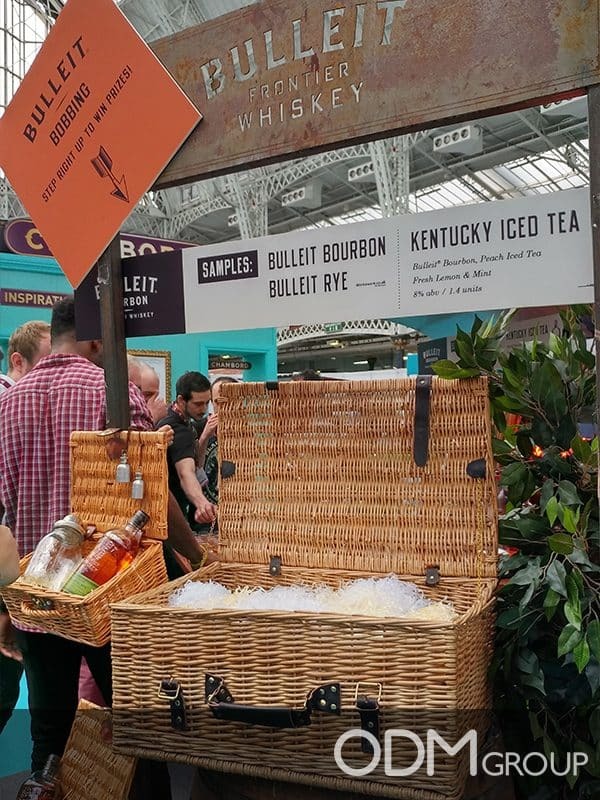 Bulleit Whisky Frontier had some of the coolest trade show marketing ideas at Imbibe Live 2017. They prepared fun games for visitors and exciting contest giveaways. Their brand activation campaign was unique and effective as the reward system involves active brand interaction. The game was an interactive one. 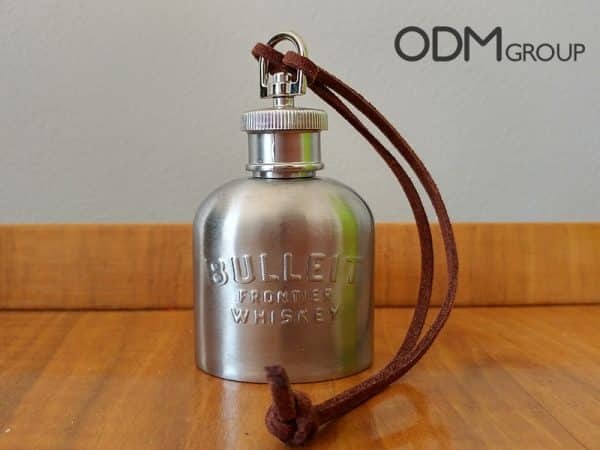 Customers were asked to draw a flask from the basket, with each flask filled with either Bullet Borbon Whiskey or Bulleit Rye Whiskey. Participants had to taste the drinks before the game to know the difference. If they guessed the products right, they will get exclusive liquor promo gifts such as branded t-shirt and promotional flask. Interactive: Customers will have to taste and guess what type of liquor is inside the flask. They get exclusive customer giveaways if they win, which motivates them to participate. Once the customers tasted their products, they might decide to buy them. Improves Experience: This trade show marketing scheme is a great way to appeal to the senses and make a great first impression. Customers will always remember the fun that had transpired during the game and this can affect their perception of the brand in a positive way. The Branded Flask is a Collector’s Item: The small branded flask serves as a tangible reminder of their fun experience at the trade show. The shiny metallic body with embossed logo looks high quality and quite resembles vintage liquor flasks. Collectors and drinks enthusiasts will definitely love the design. The Branded Shirt Raises Brand Awareness: Also, the branded t-shirt, which can be used by customers, can help raise brand awareness outside of the trade show booth. Nice Presentation: The use of custom POS display made their presentation more appealing to potential customers and clients. 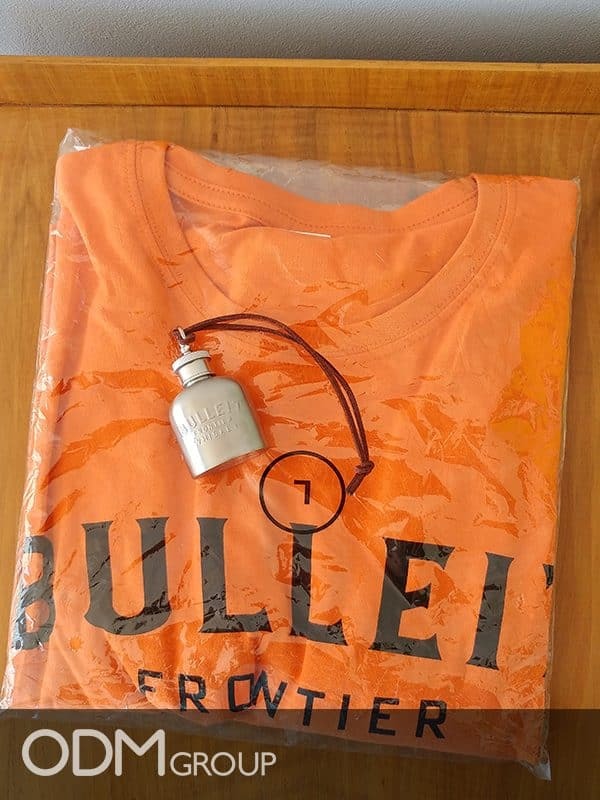 Bulleit Frontier Whiskey succeeded in creating a wonderful brand experience during the trade show by incorporating games and contest prizes. Also the taste tests is an effective tactic as it gave customers an idea how their products differ from other whiskey brands at the show. Did you find this idea interesting? If you need help with trade show marketing ideas or drinks promo gift, turn to The ODM Group. We can help from brainstorming design concepts through the production and shipping promotional products. We rounded up some of our favorite marketing ideas for drinks below. Do check them out! This blog is full of wonderful drinks promotional ideas from Imbibe Live. Kitchen towels in the shape of wine bottles. Now that’s interesting!